Easy to install slip-on mufflers with 3-1/2 inch bodies will liven up the exhaust note on your Roadstar without upsetting your neighbors. 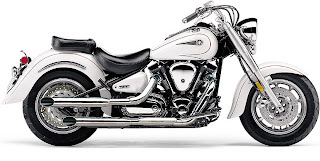 With a stock exhaust, your new bike probably sounds like an idling refrigerator. But a pair of shotgun pipes might set off every car alarm in the parking structure. Looking for a happy medium? The 3-1/2 inch muffler bodies include a quiet baffle with additional silencing material. What you get is a deep, throaty, rumbling exhaust note that won't have the neighbors up in arms.